This sculpture was part of the group exhibition ‘Indicators: Artists on Climate Change,’ on view at Storm King Art Center May 19, 2018 - November 11, 2018. Installation of pine logs, mixed media. 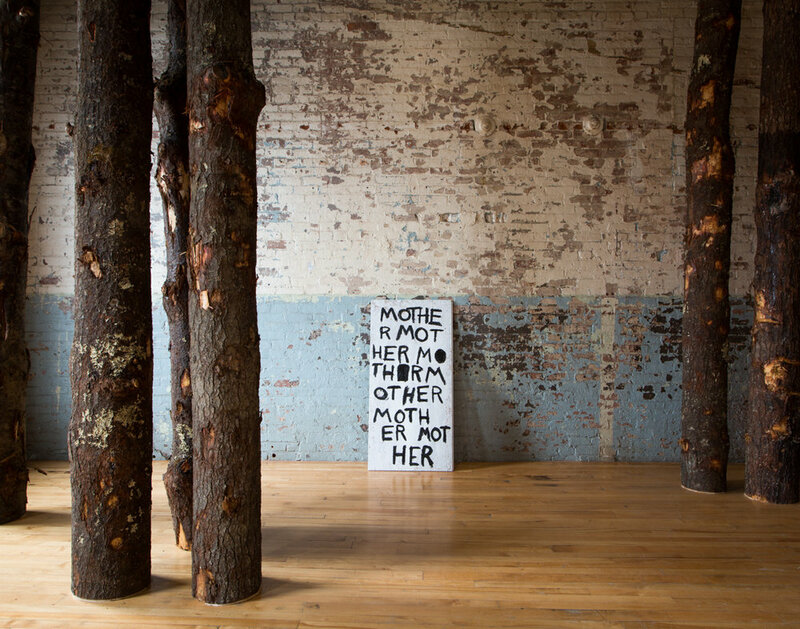 From the exhibition, Allison Janae Hamilton: Pitch, on view at MASS MoCA from March 25, 2018 - February 2019. From the exhibition, Fictions, on view at the Studio Museum in Harlem (2017-2018) and Allison Janae Hamilton: Pitch, on view at MASS MoCA from March 25, 2018 - February 2019. Installation on view at the Studio Museum in Harlem, September 2017 - January 2018. Installation featuring three-channel video projection with audio, taxidermied alligator carcasses, horse manes, wooden and metal tambourines, wrought iron, fabric. On view at the Wallach Art Gallery, April - May 2017. Installation of ropes, bed sheets, horse hair, alligator and pheasant carcasses, night gown, wedding veil, and other items. On view at the Museum of Modern Art September 2016. Installation of metal, concrete, vintage bedsheets, video projection, glass jugs, and freeze-dried roses. Dimensions flexible. Installation of pheasant carcasses, video projection, vintage house dress, metal, antlers, glass, and vintage bedsheets. Dimensions flexible.